FAQ: How durable are blivet/collapsible water tanks? Question: Hello. I am looking for a 500 gallon blivet water tank or collapsible tank. I require tanks that I can place around my site to help supply water at needed times. How durable is the collapsible tank that you offer? Would the contact time be the same as the life span? Answer: Our blivet water tanks (also known as Collapsible Water Tanks, Pillow Tanks, or Flexible Tanks) are available in several capacities and materials designed to help meet specific site requirements. We have often made tanks that are equipped for construction sites, mining facilities, residential storage and even military operations. These pillow tanks are designed to be extremely durable and have successfully stored drinking water in hot climates, cold climates, and in various other demanding circumstances. The contact time for a collapsible tank is designed to specify the moment in time in which the fabric used for your tank may start to change based on the weathering and storage process. It is not intended to be used as a life span for your tank. Tanks have often lasted well beyond their contact time. A contact time will usually be provided based on the thickness of the tank fabric. Thicker fabrics are often used for long-term storage requirements, demanding conditions, or DOD specifications. The collapsible water tank will be constructed using any number of first-grade fabric materials. Fabrics are chosen based on your application, desired storage length, price range and site conditions. For drinking water, any fabric used for your tank will contain FDA and NSF 61 approval to ensure the safe storage of potable water. Collapsible pillow tanks are made in a wide range of sizes, including a 500 gallon model. 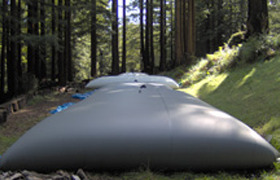 Learn More about Collapsible) Pillow tanks for water storage.